I love workwear. And when I say workwear, I mean I want a job where I can wear perfectly-cut Westwood dresses, casually powerful jumpsuits, and those ever-recurring camel-coloured winter coats. I've begun to notice that, much as I will swoon over a beautiful gown or admire a street style look, the real looks which draw me in are the professional ones. This is especially true of the way I watch TV characters. For someone to become my TV style icon du jour, I quite often need to see them in their work outfits, thus cementing them as the new ideal of elegance and power in my sartorial aspirations. Here are my top 5 favourites. Baroness Stein is the head of the inherited family business, a role which requires a selection of outfits for events, meetings, and business trips to Israel. Her style is chic, but seems effortless. It's a combination of floaty fabrics, expert tailoring, and off-piste colour choices. Maggie Gyllenhaal says of her character that "she's so much more alive than I am." There's a sense of that in her clothing: in a room of people, she stands out physically, as well as through her personality. I also love the clothes which her assistant Frances (played by Genevieve O'Reilly) wears. They often feel like they have been chosen to compliment Nessa's, turning Frances into a suitable lady-in-waiting for this honourable woman. Regular readers of my blog who thought I might have moved on from talking about The Hour by now are sadly out of luck. Much as I could gush about Lix's elegant trousers & nonchalant cigarette combinations, or Marnie's perfect princess housewife dresses, it is the wardrobe of Bel Rowley which I must constantly return to. As a female producer of a brand new current affairs programme, she has a lot to prove in the still very sexist world of the 1950s. Rather than trying to blend in with the men, she wears gorgeous skirt suits in bright primary colours. Romola Garai, who has an incredible figure, looks great in Bel's pencil skirts and padded shoulders with nipped-in waists. She basically looks beautiful and in-control all the time, even when she is having a crisis of confidence. It is, of course, difficult to compete with the expert three-piece-suit wearer Patrick Jane (Simon Baker), but Agent Lisbon (Robin Tunney) doesn't need to try. Her style is a wholly different affair. She looks smart enough for the office in relaxed shirts and classic black suits, but she's also pretty ready to draw her gun and pursue criminal's at a moment's notice, often in the same suit, or sometimes wearing a leather jacket and matching boots. Her outfits are almost like a more casual, Californian version of those worn by her counterpart Detective Kate Beckett in the New York-based show Castle. What I love about Teresa is that she isn't a showman like Patrick - there's no need for fancy suits or for rifling through other people's cupboards looking for tea - she just gets on with her job and does it well. It's why they make a great team. 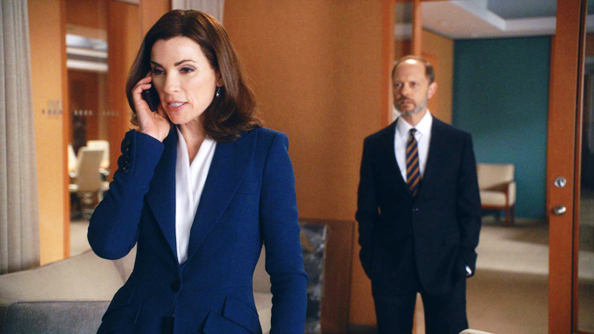 Forgive me, Good Wife aficionadoes, for I've only just caught up with the hype and started watching this series, but I'm already hooked on Alicia's story, as well as her outfits. Costume designer Dan Lawson says he likes to dress people in a "column of colour" for a strong, powerful look. And it really works, whether in a suit or a dress, because it makes you seem taller. It also creates a sleek professional look which works well with Julianna Margulies' glossy dark hair. It would be a travesty not to also mention Diane (Christine Baranski), whose cool glamour is just the right mix of Hollywood and the courtroom, and Kalinda (Archie Panjabi), who keeps things rather more casual but still interesting, similar to other TV investigators like the aformentioned Lisbon and Beckett. Toiling away at a TV network where she is always number two to bosses of variably unhinged temperaments (whom she invariably ends up in bed with), Carol manages to always maintain her upbeat approach. That's what I love about her: she's an embodiment of all the optimism of LA. She manages to pull off a range of workwear, though mostly based around figure-hugging cuts. I also often notice when I'm watching what great arms Kathleen Rose Perkins has, and the costume department has obviously noticed too, often choosing sleeveless pieces with high necklines which draw attention to those arms and her signature haircut. Her minimal aesthetic makes Carol look like a woman who knows what she's doing, and since she's practically been running the network for so many years, she probably does. I love that actress from Episodes! Do you know where that dress is from?